Property Clearance | Ashford Cleaning Contractors Ltd.
We have a vast portfolio of property clearance projects for industrial, commercial and domestic clients – including some of the biggest property management agents in the area. We arrange collection and disposal of waste materials and then organise the cleaning work afterwards. After the clearance work is finished property agents usually require the premises to be cleaned to a high standard. 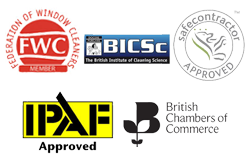 With our cleaning expertise at Ashford Cleaning Contractors Limited we organised everything including high level cleaning, external cladding and windows.